Scrum in the Classroom delivers promising results. You can read more about this in my previous blog, Scrum in the Classroom (Part 1). Scrum is well understood by many these days. Still it makes sense to explain the basics for those who are less familiar with Scrum. Scrum is not a process, technique, or definitive method. It is a framework in which people develop, deliver, and sustain complex products. You can read all about it in The Scrum Guide. The Product Owner (who owns the problem) manages the Product Backlog (a prioritized wishlist) in order of value. 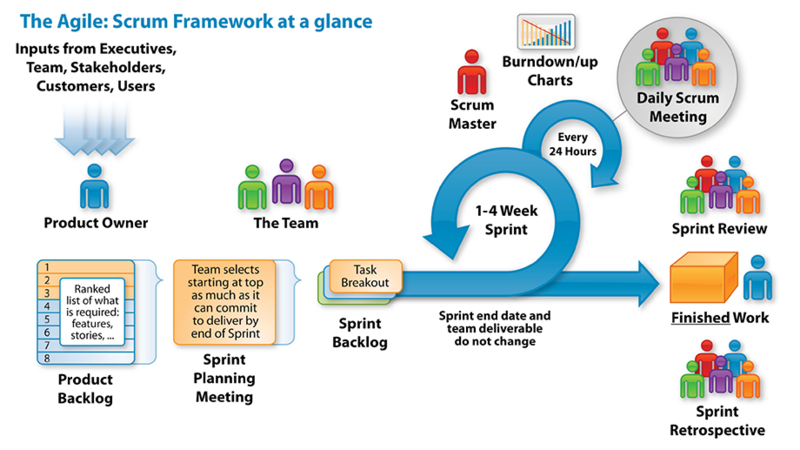 In Sprint Planning, the team breaks down the top of the Product Backlog in smaller pieces of work so that the team is capable to deliver those pieces one by one in their Sprint. A Sprint is a time-bound period up to 4 weeks. During the Sprint the team meets every day in the Daily Sprint. They discuss, in relation to the sprint goal, what the team members accomplished last day, what they will work on the coming day and if they face any impediments that needs resolution. The Scrum Master, a servant-leader and coach, ensures that the team stays on track with the sprint goal. At the end of the Sprint, in the so called Sprint Review, the team presents their product increment, so that the increment can be inspected and the Product Backlog adapted if needed. The Sprint ends with a team Retrospective; what went well and what can we further improve? Subsequently a new iteration starts with a next Sprint Planning event. Important for 'Scrum in the Classroom' is that (1) the elements of Scrum provides for Transparency, Inspection and Adaptation and (2) that the team must commit to the values of Courage, Focus, Openness, Commitment and Respect. These are the competencies and character skills that can also be found in the recommendation of the World Economic Forum in their report on '21st-century skills'. Skills that are becoming increasingly important in our fast changing world. How can we apply Scrum to the Classroom? The teacher takes the role of Product Owner and Scrum Master. As a Product Owner, the teacher maintains the backlog in such a way that the learning goals for the coming period can be met. One of the backlog items could be, as an example, that the teams must write a letter in French to president Macron in which they must make use of certain grammar rules. As a Scrum Master the teacher safeguards that the teams are on track with meeting the learning goals, in which the Scrum framework has several tools available to assist in this. As the team matures, some elements of the Scrum Master role naturally flows to the team. The team takes ownership how they are going to meet the set learning goals. In the sprint planning meeting they analyze the backlog, ask questions to the teacher, break down the backlog items in tasks and plan their tasks ahead. This helps the students to get a good feel about what needs to be done in the coming school period. Each lesson ‘slot’ starts with a daily standup; How is the team doing? Who is going to take which task? Are there impediments? If a team finishes a backlog item, the team demonstrates that to the teacher and sometimes to the entire class. The teacher provides feedback and coaches the team to become increasingly independent. At regular intervals the team retrospectives take place, either at the beginning or at the end of a lesson. This helps the team to further improve themselves. The above list is of course not all encompassing. I am deliberately leaving out certain elements in order for the blog to remain understandable. A team composition of 4 students, 2 boys and 2 girls, seems to work well. Team size. In Scrum a team size of 3-9 is recommended; in the classroom a team of 4 works best. Product Owner and Scrum Master. The teacher takes both roles and sometimes for up to 8 teams in one class! Sprint length. A typical sprint length could be a school period, where-as in business it is 1-4 weeks. Daily Scrum. Because the lesson ‘slots’ are short, a daily standup can not take more than 5 minutes. Scrum board. Students often move around from class to class. This requires a mobile visualization (Scrum board) of the tasks and their progress. Product Backlog maintenance. In Scrum the backlog is refined and re-prioritized all the time based upon new insights. In school the backlog is pretty firm as the learning goals for the coming period are fixed and must be met. More tweaks are needed. But be assured that the core values of Scrum remain in place. This blog series are written from within our passion for Scrum in the classroom and the beautiful things we see transpiring. I have therefore great respect for the early pioneers of Scrum in the classroom. For the teachers that have to become coaches. For the students that suddenly have to take ownership and initiative. For the school boards, the coaches and the trainers. And everyone else who is contributing to this blog series. Thank you! The next blog will be about how Scrum develops the 21st-century competencies and character skills (expected early April). Contact: yes please! The introduction of Scrum within the class room is one of our passions. Feel free to contact us if you have any questions and/or when you want assistance at your school (www.Incrementor.com).